Your wedding photographs should bring you years of pleasure, so select your photographer with great care. Good photographers are in high demand so start interviewing candidates six to nine months before your wedding date. Look through the wedding albums of friends and relatives to see if their wedding photographer's work interests you. Your caterer, florist or reception-site coordinator may also provide some helpful leads. ... When interviewing a photographer, be sure to discuss the number of pictures he or she takes, the cost of each print, the style and cost of the albums and whether there are travel costs or extra fees. Ask to view sample-wedding albums. These are perhaps as important as individual shots since they give you an idea of the scope of the photographer's talent. Discuss formal portraits to be taken either in the photographer's studio or on location at various sites. ... Most wedding photographers offer a package, which consists of a predetermined number of pictures in various sizes, the prints and the album. Ordering a package can be a cost-effective option and some photographers offer packages for parents' albums, too. Wedding photographers usually keep the negatives. Ask how long they hold onto the negatives and if they'll be available for purchase sometime in the future. ... Also, make sure the negatives will be stored in a fireproof safe or file. ... Don't underestimate the importance of liking your photographer. Choose someone whose personality will make you and your guests feel at ease. Aside from liking their work, it's imperative that you and your wedding photographer should be able to communicate clearly. ... You may want to meet with several photographers before making a final selection and it's recommended that you hire a professional who specializes in weddings, not a part-time photographer or someone who occasionally handles large events. ... To make sure there are no misunderstandings, include all aspects of your agreement with the photographer in a written contract. The contract should include the wedding date, the photographer's arrival time, length of shooting time and fees and overtime charges, if any. It should also include the photographer's name, so you are guaranteed that the person you met with, and not an assistant, takes the photos. ... 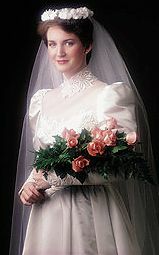 List all locations: the bride's home, ceremony site and reception site, and provide addresses and directions for each. Include the cost and details of a photo package selection and the cost of additional photos you may want to order. ... If you're planning to send an announcement of your wedding to the newspaper, be sure that the photographer can take a black-and-white portrait of the two of you as husband and wife. Order an 8x10-inch, black-and-white glossy print to send to the newspaper.